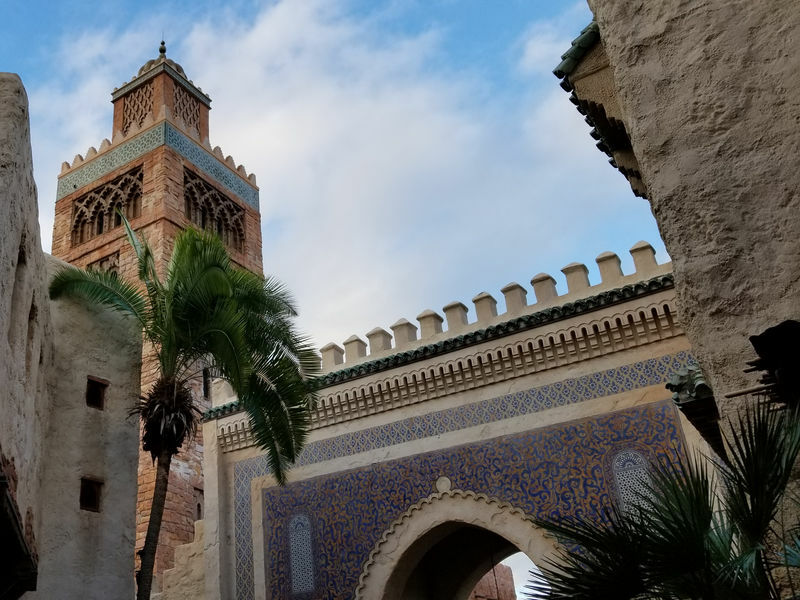 While the real Morocco is located on the westernmost tip of north Africa, bordering Algeria to the east and the Moroccan-occupied Western Sahara to the southeast, Epcot's Morocco pavilion is located between France and Japan. From across the World Showcase Lagoon, the Koutoubia Minaret (prayer tower) can be seen. The showcase re-creates the architecture and atmosphere of this famed northern African kingdom. Three cities are represented: Casablanca, Fez, and Marrakesh. The landscape is dominated by plants of economic importance, a reflection of the integral role agriculture plays in this country. Exotic and beautiful, the entrance of the Morocco pavilion is the Koutoubia Minaret, the famous prayer tower in Marrakesh, and is an introduction to this north African country. Feel free to walk into the old city portion of the pavilion, filled with stores that handicrafts, jewelry, brass pots, and clothing in a marketplace that might remind you of the marketplace scene from Raiders of the Lost Ark..
Join Moroccan cultural ambassadors on a 45-minute Treasures of Morocco tour to learn about their culture, lifestyles, and country. Dining options include Tangierine Cafe, a counter-service restaurant where you can get a good sampling of a number of delicious Mediterenean dishes, and Restaurnat Marrakesh, a fancier sit-down restaurant. Location: The fourth national pavilion to the right as you enter World Showcase from Future World. Fez House See a typical Moroccan home. 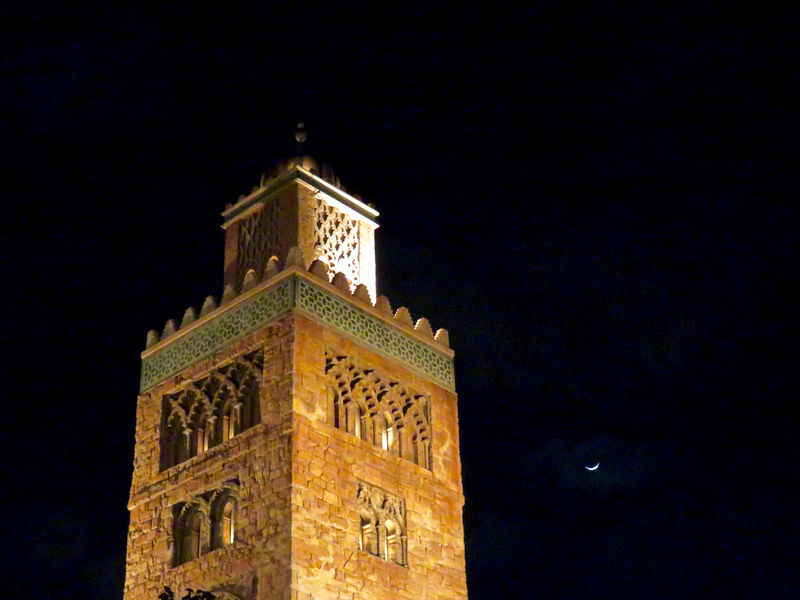 Gallery of Arts and History A museum exhibit on Morocco's contributions to the worlds of art, science, and technology. Mo'Rockin An interesting blend of Middle Eastern and Western rhythms. Morocco Refreshment Cart Alcoholic and non-alcoholic beverages, as well as pastries. Restaurant Marrakesh Traditional Moroccan cuisine in an opulent environment with entertainment. Tangierine Cafe Incredible sandwiches and shawarma, with a great coffee bar and desserts. Berber Oasis Jewelry and and handmade leather items. Casablanca Carpets Handmade Persian rugs and carpets; they'll ship anywhere in the world. Medina Arts Crafts and toys made from wood, some clothing. Tangier Traders Moroccan and Middle Eastern clothing. The Brass Bazaar Brass accessories for the home. At this location: This piece of World Showcase remained unused until Morocco became the first pavilion to open after Epcot, on September 7, 1984.